Epson has simplified the process required to secure Apple’s approval for iOS Bluetooth applications. Epson’s software development kits (SDK) are designed to shorten the development time required to implement mobile POS applications, enabling support for wireless POS printing from handheld peripherals. Mobilink also supports Google’s Android mobile technology platform and Windows operating systems, with connectivity options such as Wi-Fi 802.11 and Bluetooth. 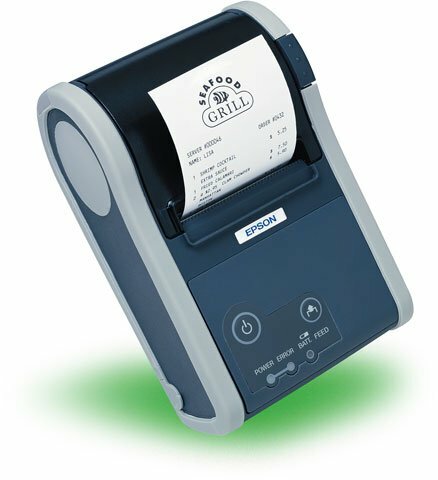 Mobilink was the first wireless mobile receipt printer designed specifically for retail and hospitality environments and has been growing in popularity since its original launch in October 2003. Mobilink is based on Epson’s best-selling TM-T88 series and is designed for high-speed, reliable on-the-go thermal receipt or label printing. With features such as an autocutter with its receipt version and a label peeler with its label version, Mobilink supports a wide range of mobile printing applications including line busting, table-side service, warehousing and logistics, route sales, and shelf and product labeling. Mobilink is ruggedized and is CPCL-compatible for easy drop-in Zebra replacement. Mobilink is available with belt clip and shoulder strap options for maximum flexibility and both receipt and label versions are now available through Epson’s extensive reseller and distribution channels. For further questions or help finding the right mobile printer for your application, contact us at BarcodesInc. « The New Star SM-S220i Is Now Available!